Home » Watches » Kermit or Hulk? 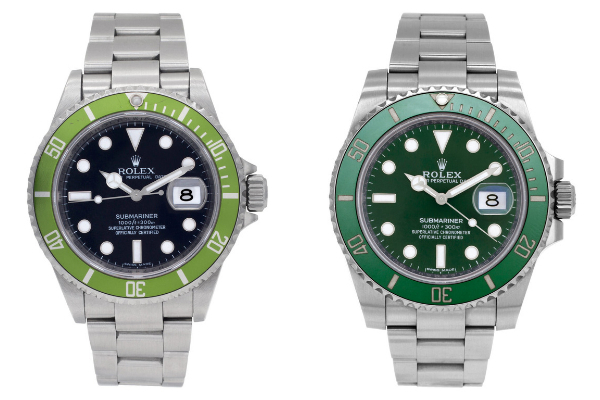 Which is the Better Green Rolex Submariner? As the most popular luxury dive watch in the world, the Rolex Submariner hardly needs an introduction. 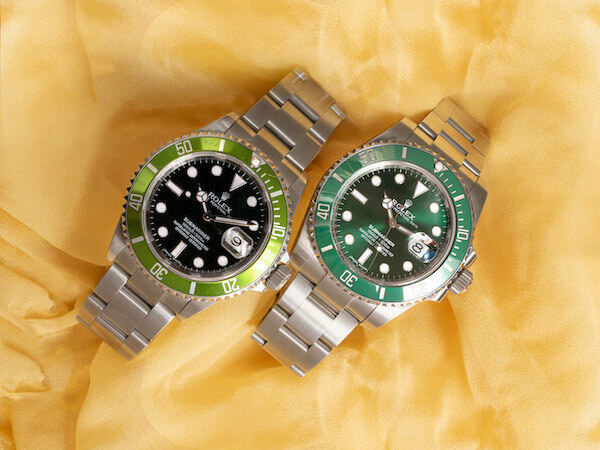 And among Rolex’s dive watch lineup are two green Submariners, which have proved to be very popular. Today we’ll be comparing the Submariner 16610LV “Kermit” and the Submariner 116610LV “Hulk” to see which is the better green Rolex Submariner. To celebrate the Submariner’s 50th anniversary, Rolex released the ref. 11610LV at Baselworld 2003–the very first green Rolex Submariner. The Anniversary Submariner ref. 16610LV sports a 40 mm stainless steel case, green unidirectional bezel, black dial, and stainless steel Oyster bracelet. The watch’s most defining feature–the green aluminum bezel–was quite a polarizing design addition to the famed Submariner. Fun fact, the letters LV in the reference number is an abbreviation for “Lunette Verte,” which is French for “Green Bezel.” Prior to this option, the only other bezel colors in the Submariner collection was black on steel models and blue on gold and two-tone models. Another new design detail that was new to the Submariner ref. 16610LV was the so-called Maxi dial layout, characterized by larger lume-filled indexes and fatter luminous Mercedes-style hands for improved legibility. 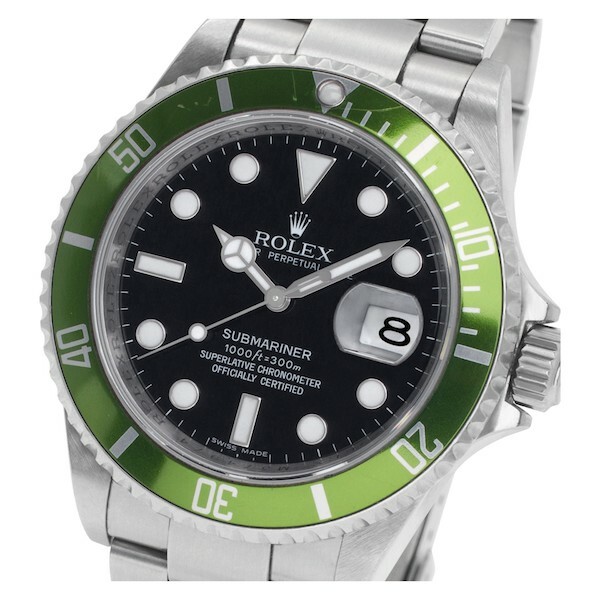 The Submariner 16610LV uses SuperLuminova as its luminescent material, which glows green in the dark. As a Submariner Date model, there’s, of course, the date window at 3 o’clock, along with the customary Cyclops magnification on the sapphire crystal. Powering the watch is Rolex’s reliable Caliber 3135 automatic movement with a 48-hour power reserve. Plus, thanks to the Submariner’s screw-down fluted caseback and screw-down Triplock winding crown, the ref. 16610LV is water resistant to 300 meters (1,000 feet). 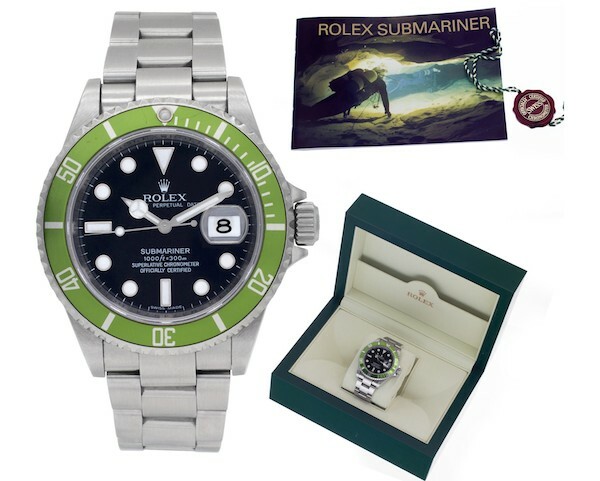 In 2010, another green Rolex Submariner was released to replace the Sub 16610LV; the Submariner ref. 116610LV. While the Submariner ref. 116610LV and the preceding ref. 16610LV share some traits such as a 40 mm case diameter, stainless steel construction, a green bezel, and an Oyster bracelet, these are two very different watches indeed. First of all, the newer Rolex Submariner ref. 116610LV features what is known as a Super Case, which is not only broader than the previous version but also includes fatter lugs and squarer crown guards. The end result is a bulkier case (hence the Hulk nickname) despite the same 40 mm size. Furthermore, the green unidirectional bezel on the Submariner ref. 116610LV is made from Cerachrom ceramic rather than aluminum. Cerachrom is not only prized for its distinct look, but also for its resistance to scratching and fading. Note that the particular green shade on the Submariner 116610LV is darker than on the 16610LV. 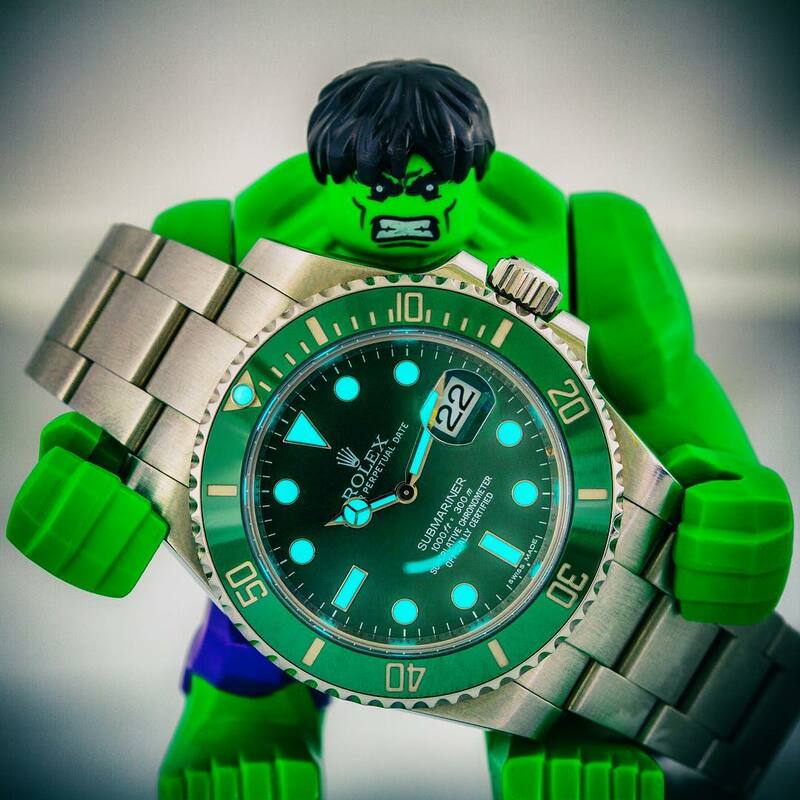 To emphasize the color of the watch, the green shade is not limited to just the bezel, but in fact, the Hulk also includes a vibrant green dial. Another change to the dial is the use of Chromalight luminous material for the indexes and hands, which glows blue in the dark instead of green. Identical to the older green Sub, the 116610LV also includes a date window at 3 o’clock and a protruding lens on the sapphire crystal. Rolex also improved the Oyster bracelet of the Submariner ref. 116610LV with solid center links and an improved clasp. The solid links help to prevent bracelet stretch over time (and don’t rattle as the older ones do) while the clasp includes the super practical Glidelock diver’s extension to accommodate thicker suits. Movement wise, the Submariner ref. 116610LV also runs on the tried-and-tested Caliber 3135 self-winding movement and the watch retains the same water depth rating. 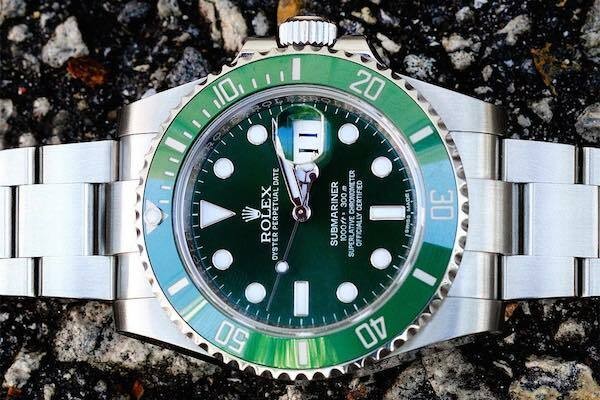 Which Is the Best Green Rolex Submariner For Me? When held side by side, it’s clear that the Kermit and the Hulk cater to two different audiences. The older Submariner ref. 16610LV is the more classic option while the newer Submariner ref. 116610LV is the more modern approach to Rolex’s signature dive watch. So when deciding between the Submariner 16610LV “Kermit” and the Submariner 116610LV “Hulk,” ask yourself if you prefer a classic or a contemporary version of a green Rolex Submariner. There’s no wrong answer here; as always, it a matter of personal taste. Take a Drive With the New Breitling for Bentley GT Dark Sapphire Honoring the new Continental GT, Breitling introduces the Breitling for Bentley GT Dark Sapphire. Three Ways to Wear a White Gold Daytona Like all Rolex tool watches, the Daytona chronograph began as a stainless steel model.